May 30, 2017, San Francisco – the Rachel Corrie Foundation for Peace and Justice and the Center for Constitutional Rights (CCR) filed a “friend of the court” brief to the Ninth Circuit Court of Appeals in a case brought by the parents of an American teenager killed by Israeli commandos. Eighteen-year-old human rights defender Furkan Doğan was shot five times, including in the face at point-blank range, when Israeli soldiers raided the Mavi Marmara in international waters in 2010. The ship was part of a six-boat flotilla that attempted to break the siege of Gaza and deliver humanitarian aid to Palestinians suffering under Israel’s closure of the Gaza Strip. In the lawsuit, Doğan’s parents are seeking accountability for the extrajudicial killing and torture of their son. Attorneys say international and U.S. law clearly provide accountability and redress for extrajudicial killing and torture by former foreign government officials. The lawsuit was filed under the Alien Tort Statute and the Torture Victim Protection Act. A district court dismissed the case after the U.S. government submitted a “suggestion of immunity” for the defendant in the case, former Israeli Minister of Defense Ehud Barak, following a request to the State Department by the Israeli government. 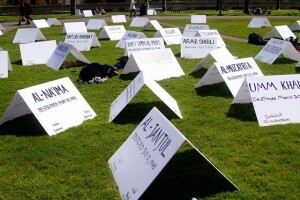 Through Freedom of Information Act (FOIA) litigation, CCR obtained more than 15,000 pages of documents demonstrating that the United States declined to conduct an independent investigation into Furkan Doğan’s death and undercut efforts at the international level for Israel to be held accountable. CCR submitted the amicus brief with the Rachel Corrie Foundation for Peace and Justice, which was founded by the family of 23-year-old U.S. human rights defender Rachel Corrie, who was killed by an Israeli bulldozer while blocking the demolition of a Palestinian home in Gaza. CCR previously represented the Corrie family and four Palestinian families in a lawsuit against Caterpillar, Inc., which supplied the Israel Defense Forces with the bulldozers. The Rachel Corrie Foundation for Peace and Justice continues the work of human rights activist and observer Rachel Corrie. The 501(c)3 nonprofit conducts and supports programs that foster connections between peoples, that build understanding, respect, and appreciation for differences, and that promote cooperation within and between local and global communities. Through grassroots efforts, the foundation fosters the pursuit of human rights and social, economic, and environmental justice, as pre-requisites for world peace. 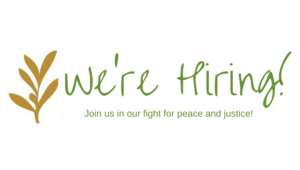 The Rachel Corrie Foundation for Peace and Justice is excited to announce that after nearly 15 years of work in Olympia, Gaza and around the world, we are looking for our first full-time Executive Director. Over the past decade and a half, the Foundation has been led by Cindy and Craig Corrie whose roles have changed and expanded over the years. While the Corries will continue to play a crucial role as founders and visionaries, this moment marks a significant growth of the organization’s capacity to fulfill its mission of continuing the work that Rachel Corrie began. Cindy and Craig Corrie look forward to continuing their volunteer work with the foundation but also to spending more days with their children and grandchildren, traveling, and serving all of their communities in new and creative ways. Please find the job announcement below in the Executive Director Packet along with the Application for Employment. For questions about the position, reach us at [email protected]on.org. Applications are due by Friday, June 30, 5 p.m. PDT. Rallies and demonstrations took place today throughout Palestine where several people were injured by Israeli forces. The Israeli state has never taken responsibility for this foundational illegal and ethically outrageous act. Today, 6.6 million Palestinian refugees and their descendants are denied their Right of Return, a fundamental principle of international human rights and humanitarian law. Furthermore, the Nakba did not end 69 years ago, but continued in episodic waves. Israeli practices during the 1967 War produced the forcible displacement of 130,000 Palestinians in the West Bank and Gaza Strip. Today, the displacement of Palestinians operates through consistent attacks and pressures targeting communities like Palestinian citizens of Israel in the Naqab (Negev) and Palestinian residents of the West Bank. The precarious position of Palestinian refugees throughout the Middle East puts them at greater risk for multiple displacement in countries like Syria. Today, Nakba Day, is also the 29th day of a mass hunger strike waged by more than 1,000 Palestinian political prisoners held in Israeli jails. The hunger strikers are facing serious health conditions. Their strike demands basic human rights and decent treatment in Israeli jails. They also demand end to the illegal policy and practice of administrative detention through which Palestinian prisoners are held indefinitely in captivity without charge or trial. Israel has imprisoned an estimated one million Palestinians since 1948. No matter their location, Palestinians face pressures of discrimination, expulsion and violence by the Israeli state. The majority of Palestinians are themselves displaced or are descendants of displaced persons. Thus, on the 69th Nakba Day, we continue to affirm in the strongest manner possible the legal, moral and political necessity of implementing the Right of Return according to UNGA 194 for every Palestinian refugee and without stipulation. The status quo has further entrenched the ongoing Nakba and the violation of all people in Palestine. The international community’s deep entanglement in creating and maintaining this status quo is especially notable in 2017, when we will also mark the 100-year-anniversary of the 1917 Balfour Declaration and the 50-year-anniversary of the 1967 Occupation of the West Bank and Gaza Strip. Ending ongoing displacement and implementing the right of return are the building blocks to addressing the daily and structural inequalities that exist and achieving justice. *** Join us to hear Ilan Pappé speak about “Prospects for Peace in Israel-Palestine” at Town Hall in Seattle on May 22nd, sponsored by the Episcopal Diocese of Olympia. Image from Land Day 1976 via “The Palestinian Revolution” website. From the lands of Wadi ‘Ara near Haifa, to Madma village by Nablus, to Bethlehem, to Umm al-Hieran in the Naqab, to Sakhnin and Deir Hanna, Palestinians commemorated Land Day today across Palestine with demonstrations, marches and by planting olive and fruit trees, as has been done on March 30th for the past 41 years. Land Day is typically met with violent Israeli repression. This year, Israeli forces injured dozens at the Madma village protest. 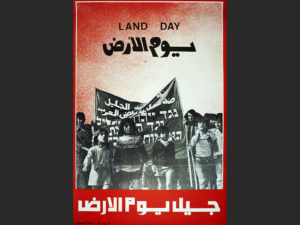 On the first Land Day of 1976, Palestinian citizens of Israel led protests and marches in communities of the northern Galilee to the southern Naqab (Negev). The actions were organized in response to Israeli state plans to expropriate over 2,000 hectares of land belonging to Palestinian villages in the Galilee. Israeli police forces fired on the crowds killing six and injuring around a hundred. Since then, Land Day has become one of the most important days on the Palestinian calendar. Why does Land Day matter? Land Day began as a direct confrontation of blatant Israeli policies and practices of displacement and colonization. 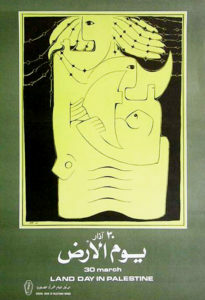 March 30, 1976 constituted an unprecedented show of popular refusal to accept Israeli policies implemented by force. 1976 became one of the most important early moments of resistance led by Palestinians with Israeli citizenship, and thus created a bridge across Israeli-imposed regimes of rule that separated Palestinians in the West Bank, Gaza Strip, Jerusalem and Israel. Palestinian citizens of Israel are those who were not displaced or were internally displaced in 1948 and lived under Israeli military rule until 1967. The annual commemoration has played an important role in Palestinian community mobilization across Palestine. 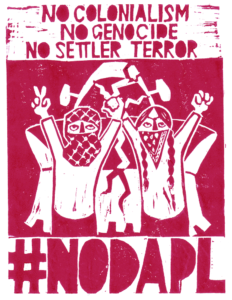 By emphasizing the land and its importance, the day of action reinforces principled opposition to ethnic-based rule and dispossession. This year, Land Day comes after the Israeli state began in January 2017 to fulfill its promise to evict the Palestinian residents of Umm al-Hieran in the Naqab. The government intends to establish a Jewish-only settlement on the land of the Palestinian village. Additionally, and emboldened by a Trump administration, Israeli legislators proposed settlement expansion and land annexation in the West Bank. Palestinians continue to organize and resist these new developments on decades-old practices. Grassroots activism and Palestinian rootedness is much of what Land Day has come to represent. Resist the Muslim Ban, DAPL & deportations. Fight the Wall from Palestine to Mexico. On Friday, February 3rd, Seattle Federal judge James Robart temporarily blocked Trump’s Executive Order banning citizens of seven countries from entering the US through a ruling on the basis of damage to Washington State and its residents. Driven by xenophobia, Islamaphobia and racism, the Muslim Ban was an unprecedented denial of entry to migrants and refugees that led to more than 60,000 revoked visas in the less than two weeks since it was issued. The halt on the Executive Order is at least a brief relief for visitors from Iran, Iraq, Libya, Somalia, Sudan, Syria and Yemen. The U.S. has played a central role in making countries like Syria and Yemen unlivable for a vast number of the population. While Judge Rodard’s stay plays out in the court system and was upheld by a federal appeals panel on February 9th, it is clear that popular and public presence, actions and organizing is powerful. Judge Robart’s decision came one week after a large rally against the Muslim Ban at the SEA-TAC airport along with similar demonstrations around the country that are continuing. Public protest and presence contributed to the environment in which the stay could be issued and on behalf of Washington State residents. Sustained civil disobedience over the coming months and throughout the U.S. will be key. For those of us in the U.S. and involved in organizing our communities to achieve social justice, the slew of Executive Orders issued by Trump in the first days of his term along with absurd cabinet confirmations, an evident campaign of mass deportations and further announcements this week feel like the inauguration of an Orwelian world. From the Nakba to the Intifada, Palestinians have a long and varied tradition of resistance, one that we can draw lessons from for the fight that is ahead in the U.S., not just in these coming months and years of Trump’s term, but into the administrations to follow. We need a strong grassroots community-based civil society in order to create lasting fundamental social change in this country whether under an Obama or a Trump. In building on the momentum generated early and planning for the long run strategically, we can draw from the decades-long and inspiring history of resistance by the Palestinian people as well as the role of solidarity that Rachel Corrie exemplified. The Palestinian resistance to oppression and displacement is long and varied. A new digital pedagogical resource on Palestinian revolutionary culture from the 1950s through the 1970s provides photos, videos, oral histories and a 12-week syllabus about the intellectual thought, organizational methods and key events of that history. High points from the Palestinian history of resistance provide inspiration and guidance, such as the massive rally of Land Day on March 30th, 1976 challenging the confiscation of Palestinian land by the community of Palestinian citizens of Israel. In another example, the massively popular and grassroots participation in the first Intifada (1987-1993) shows that sustained and inclusive civil disobedience can bring all-powerful seeming forces to a standstill. It is especially pertinent to emphasize the intersectional struggles and comparative lessons in 2017 as the Occupation enters its 50th year. Rachel was motivated by a strong moral compass and responsibility towards realizing justice. January 27th, 2003 was the first day she entered the Gaza Strip where she worked with local communities like that of the pharmacist Samir Nasrallah and his family. Rachel was killed by Israeli soldiers on March 16, 2003 while putting her body between the bulldozer and the Nasrallah family home. Her commitment was underwritten by a philosophy of solidarity that was made up of the small everyday acts of support and resistance, a philosophy we can all work to develop in our practice of solidarity. The time has come for mobilizing, organizing and resisting. This is not only crucial for this moment when the U.S. is headed by an openly xenophobic president, but for future administrations, too, whether Democrats or Republicans. From the grassroots, what we are seeing is an inauguration of communities of struggle that will be necessary for creating the just world we require. “This realization that I will live my life in this world where I have privileges. In this time, it is important to keep in mind that sustaining community organizing is based on the small acts like ‘washing dishes’ as well as showing up for multiple intersecting struggles. 1. Resist the shared agenda of Bibi & Trump who will meet in Washington, February 15th. Take action and watch the US Campaign for Palestinian Rights video #BadRomance here. 2. #NoDAPL Week of ActionFebruary 12-17th. There are many ways to respond to the call for global solidarity form the indigenous leadership at Standing Rock. 3. Click here for a comprehensive #MuslimBan resource guide created by the Palestinian Youth Movement among others.